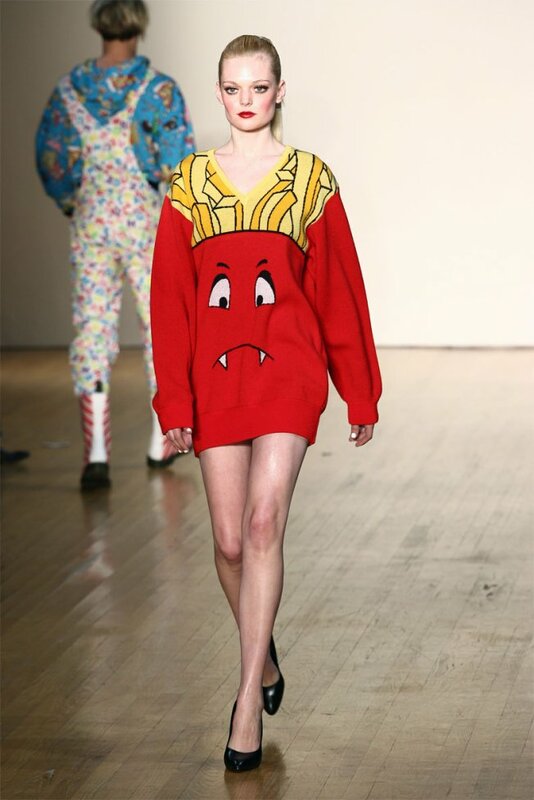 McDonald’s® French fries packagings inspired one sweater in Jeremy Scott’s Autumn/Winter 2006-2007 « Eat the Rich » show. Other McDonald’s®-inspired collections : J.W. Anderson Pre-Fall 2012 (J.W. Anderson told STYLE.com that, for this collection, he was « playing with ugly colors, like in McDonald’s® …»), Michael and Hushi Spring/Summer 2003 (this collection was influenced equally by McDonald’s® and Linda Evangelista). Furthermore, in 1998, Tom Sachs created the « Prada Value Meal » work of art, which featured McDonald’s®-style packagings, with a McDonald’s® logo that was covered with the Prada logo. Moreover, in 2005, Heidi Klum was the face of McDonald’s®, and, in 2008, Bruce Oldfield dressed the employees of McDonald’s®, in Great Britain. 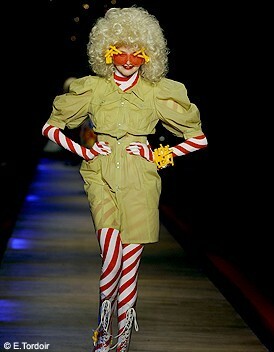 To read about French fries-inspired items, search for the « French fries » post that I have published on May 19, 2012.